I am nearing the end of day two of Art in the Park. The sun just dropped beneath the horizon, so I can no longer tinker with this watercolor. But I am more enthused with the way it’s developing than the first that I did earlier today. I am enjoying the effects of the salt in the water and foliage, and I like how the masquepen worked on the tree limbs and trunks. 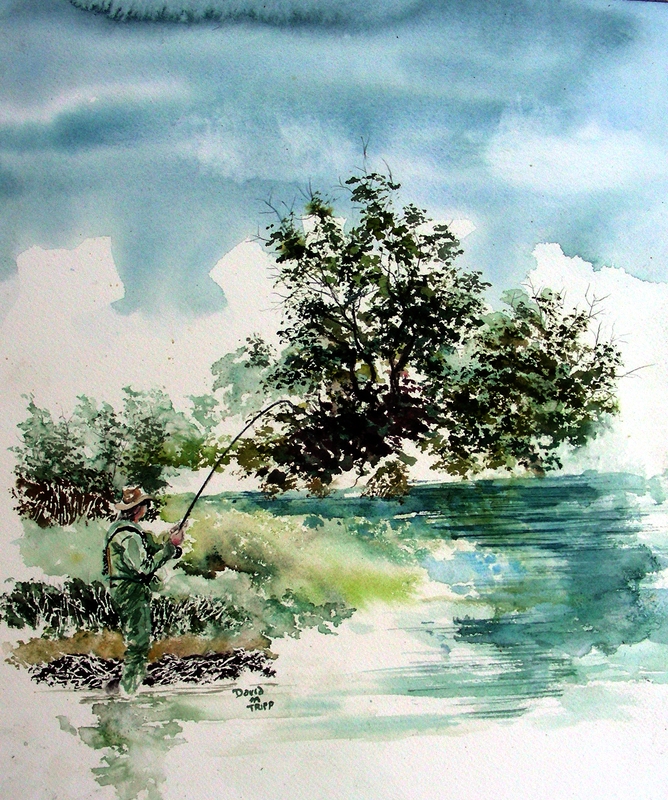 I would have liked to have devoted more time to the fly fisherman, but, as I said, it’s darkened now, and I dare not try to watercolor under dim evening light. I’m exhausted by two consecutive weekend festivals. I supposed I’ve gotten too old to keep up the pace. My allergies are a little better, but I’m still not at 100%. But it feels good to be fiddling with watercolor again, and I do enjoy the festival atmosphere. Tomorrow we’ll close at 5:00. Today is Saturday at Kennedale Texas. I’m participating in Art in the Park. The weather is absolutely beautiful, but the attendance is quite thin, so I have plenty of time to do watercolor in the booth. I started and finished this one today, and if the crowds don’t pick up soon, it looks as though I’ll start (and perhaps finish) a second piece. I worked from a photo that my guide shot of me angling a 24″ Cutthroat Trout at Troublesome Creek in Kremmling, Colorado, northwest of Denver. The sun is so bright outside that I can barely see this image on my laptop. If I find out later that it is badly reproduced, I’ll clean it up and re-post it. I use Photoshop to sharpen my photos, but honestly, I cannot see anything in this bright light today. Besides watercoloring, I am reading with great delight the Journals of the Romantic painter Eugene Delacroix. The man’s mind (as well as his paintbrush) excites me to no end. He has made me feel like such a featherweight in my journal endeavors over the past few decades. I am determined to find a way to discuss my theories on watercolor with the exactitude that he did with his oils. For sure, I do not travel the exotic lands that he did, but still I am enough of a road trip warrior that I can surely penetrate these odyssey experiments better with the written word, and with a watercolor block and camera in hand. I can’t wait for the summer season to come around so I can see about putting some of this to work. Thanks for reading. 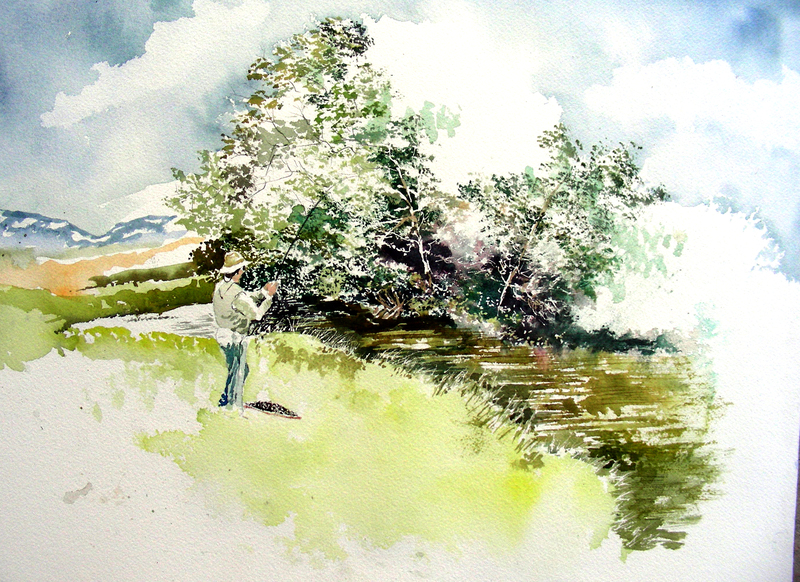 I think I’ll start another fly fishing watercolor sketch. I send you greetings, live (yes, live) from Art in the Park, Kennedale, Texas. Happily I have wireless access, compliments of the nearby public library. And they assured the artists that the access would be in place until after closing time every night of the festival. It’s wonderful, being able for the first time to blog live from my booth. It was a humid day for set-up, and I soaked two sets of clothes. But I am cool and dry now, the festival gates have opened, and I’m just waiting for patrons. The art scene is heating up. I have fifteen framed watercolors hanging in DeSoto City Hall as of yesterday. They will remain on view through the month of April. I have another exhibition coming up at Arlington Museum of Art, with the artists reception on April 20. Today begins a three-day festival (I”m still tired from the three-day festival last weekend). We will close tonight, and it is my earnest intention to get a full night’s rest. I’m still puny from the allergy sickness that has dragged me down all last week. Perhaps tomorrow I’ll have enough in me to begin a watercolor on site. It’s been a week. I feel the constant need to apologize to my faithful readers for not creating new work. I’ve been so sick this past week, and have gone to school each day anyway, and then come home to collapse into bed. Every day I am getting a little better, but I’m still not back to full health. This afternoon, I’ll deliver fifteen framed watercolors to DeSoto City Hall for an April exhibit. I’m honored to be asked to exhibit there, and it is a beautiful venue for art. This posted painting will be the centerpiece of my new show. 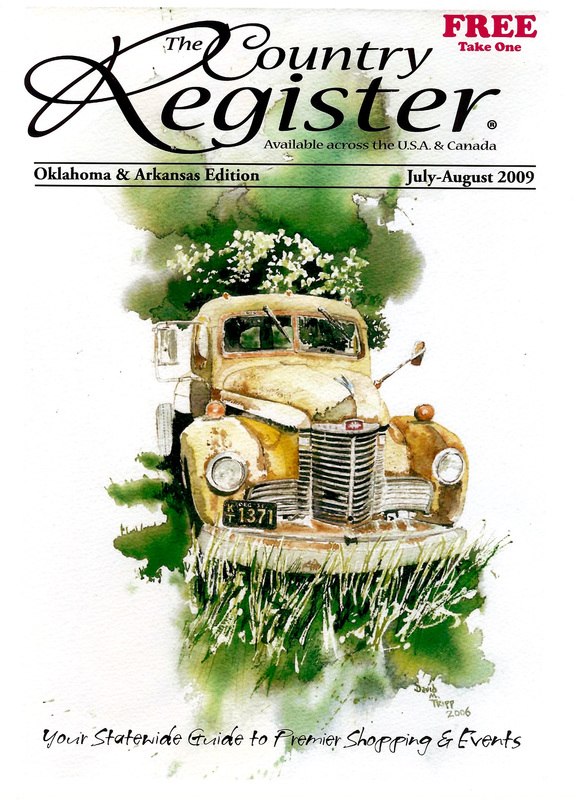 I’m showing the cover of a shopper that published the image a few years ago. I’ve managed to get plenty of mileage out of this particular watercolor. The image is a 1946 International truck that belonged to my 4th grade teacher, Betty Langhauser. For decades, I saw this truck parked beside her home when I traveled to St. Louis to visit my own parents. Mrs. Langhauser died a few years ago on the 4th of July. On my next visit home, I saw that the vehicle had been removed from the property, and know that I’ll never see it again. I’m glad I photographed it the year before she passed away and made the painting of it. 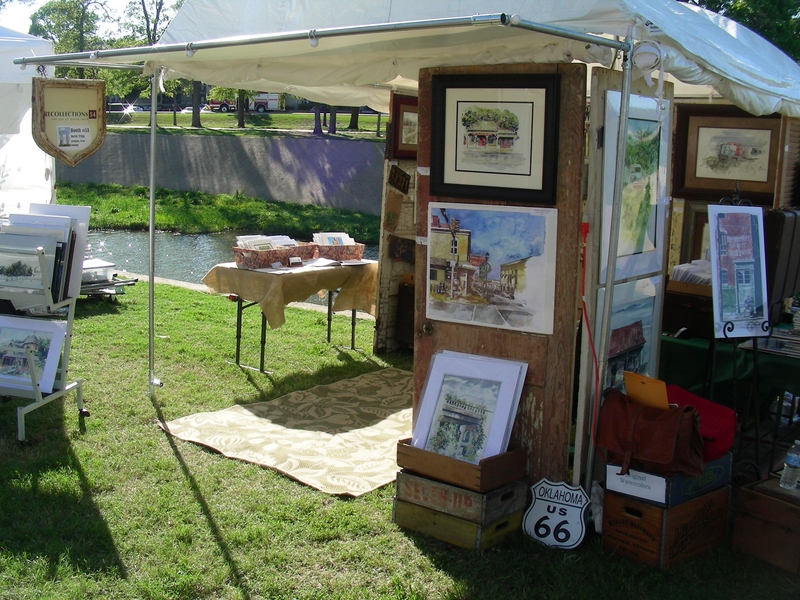 Tomorrow I begin another three-day art festival, Kennedale’s annual Art in the Park. If I have Wi-Fi access, I’ll publish from that location. If not, then I’ll publish from my home the delayed news. At the time of this writing, I am still very sick and debilitated by allergies. But I have little room to stop (though I have slept a total of 20 hours during the last two sleep cycles). I still need sleep. Tomorrow (Thursday) I will be taking fifteen framed watercolors to DeSoto City Hall for an exhibition to last through the month of April. 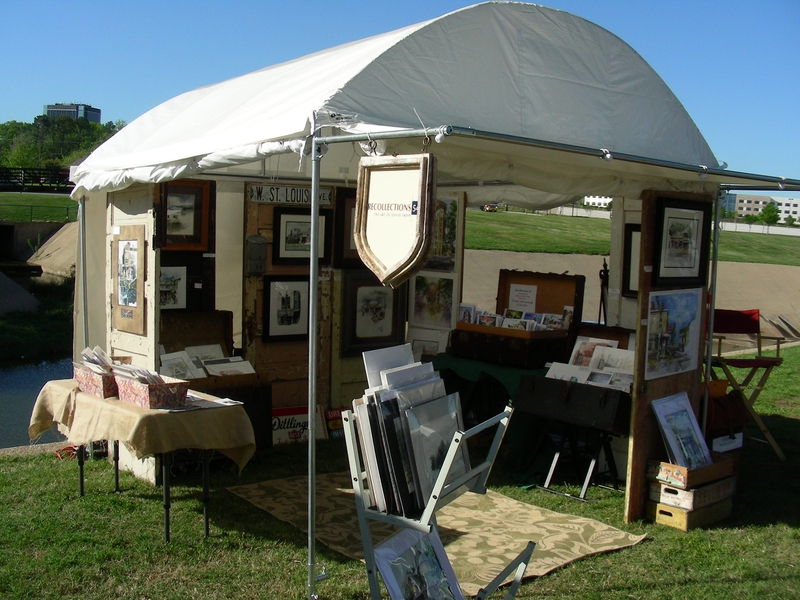 Day-after-tomorrow, I load in for the Art in the Park Festival at Kennedale, Texas which will last three days. Right now, I groan at the fact of raising my 10 x 10′ tent! “But maybe in 48 hours I’ll be up to the task. 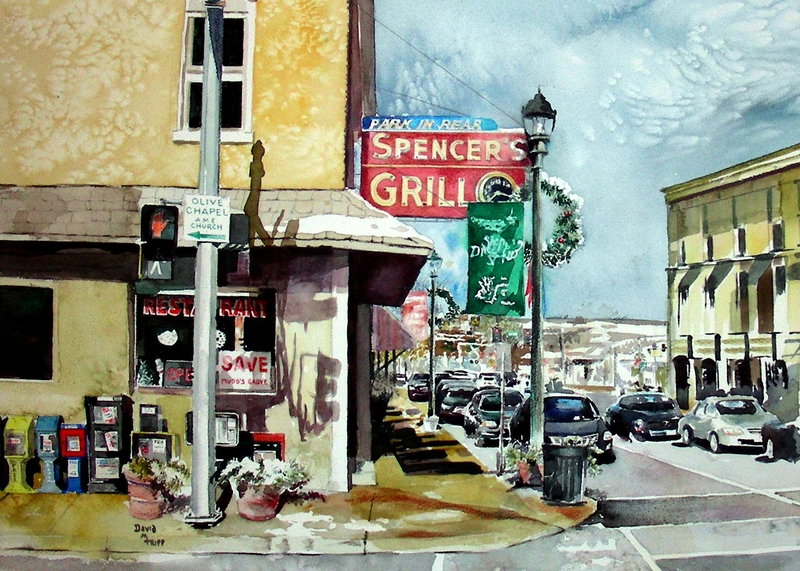 I will lead a two-day plein air watercolor workshop in Malakoff, Texas on April 12-13. The watercolor society there seems to be a very active, aggressive bunch, and I cannot wait to meet them. On April 20, I will be at the Artist’s Reception for the 5 x 5 Exhibit at the Arlington Museum of Art. This will be my first time featured in an art museum show. On April 21, my band has a gig at J. Gilligan’s in Arlington for a benefit. So, we have to schedule some rehearsals to be ready for that as well. My dance card is really filling up! I have such a desire to return to the studio to pursue watercolor, but I am so sick right now, that all I want to do is crawl into bed. And yet, at the time of this writing, I’m not even halfway through the school day. Bummer. I apologize for my recent hiatus. I became very sick with allergies Saturday night at the Art on the Greene Festival, and now on Tuesday, still cannot shake it. I am just a shell of a teacher here at school during these state-mandated tests for four hours, and then a full slate of classes following. Not a good time to be sick. The art and music festival was a resounding success. I have not yet inquired about the official numbers, but know that over 3,000 came through the park during the short days of Friday and Sunday. It would be easy to assume that the Saturday attendance pushed the numbers far beyond 10,000. My booth was full much of the time, and I enjoyed every single patron that paused to converse with me. Some patrons came, looking for bargains, some looking for just that perfect piece to fit in a space at home or at work, but many entered my booth to remember. My company is Recollections 54, as I create scenes and vistas reminiscent of our small-town America during the fifties. And I truly loved every story, every experience that was shared with me by patrons over those three days. The posted picture has finally sold, in the original watercolor. A patron who had been eyeing it for over six months came and made the purchase Sunday. And I was also delighted to sell limited edition prints of it as well as greeting cards carrying its image. It is no doubt a scene that has resonated with many. I grew up outside St. Louis, Missouri, and have known this Spencer’s Grill since my early childhood. The business was established in 1947 on historic Route 66 (now Kirkwood Road, or Lindbergh Blvd.) and the sign has been in place since 1948. The business has never closed, and I do not fail to go there when I visit my St. Louis family to enjoy a breakfast of fried eggs, bacon, hash browns and scrapple. Entering this diner is like entering a time warp in the 1940’s and 50’s. I relish every sensation and memory culled from my visits there. Proust reminds us that there are sensations that arrest us unexpectedly and take us back to warm, primal memories of our childhood that matter, that are worth remembering. Spencer’s Grill does exactly that with the smell of the old diner, coffee brewing, and breakfast foods frying. The sounds, the aromas, the look at the people hunched over the counter and crowded into the booths–all of this brings back my childhood, and my memories of an America that will not die until I do. Thank you for reading. I should be feeling better soon and return to blogging. I entered Richard Greene Linear Park on a sun-washed spring morning with the temperatures holding at a sensuous 70 degrees. The canal flowing behind my booth provided a meeting place for a circle of giggling birds. Twenty minutes later, I sat serenely in my director’s chair beneath the enormous canopy tree on the north side of my booth. The walls of the booth were rolled up, breezes were flowing through, the art work was all in place, and patrons were already beginning to drift by. The Advil successfully fought back the aches my body suffered from yesterday’s six-hour load-in and set-up. The Starbuck’s bistro “breakfast-on-the-run” proved the perfect respite beneath the tree–coffee, sliced apple, grapes, cheese slices, English muffin and honey peanut butter. I have a watercolor easel set up at my side, and I’m thinking seriously about beginning a plein air sketch for my own a, and perhaps for the passers-by. It is not an easy task, trying to describe the long stretches of space spent alone in the artist’s booth during a three-day festival. But conversations with patrons who enjoy festival art replenish my weary spirits more than I can say, and I cherish every one of them. Now, on the morning after, I can add to my journal entry. Saturday was remarkable, with throngs of people who never diminished throughout the day and evening. With this being the first large art festival in the history of Arlington, Texas, it proved a real homecoming for me, with teachers, former colleagues and former students coming by in droves and renewing acquaintances. I cannot begin to describe the well-being and comfort I drew from talking with all of them. The sales were phenomenal, and I even managed to create three plein air watercolor sketches at the easel, thus opening up further opportunities for conversation with those curious enough to approach and see what I was attempting. A splendid day indeed. Now today, Sunday, we are there once more from 11 to 5:00. Then comes the break-down and load-out, and a weary trip to the bed so I can rise at 6:00 tomorrow and begin another week at school. Greetings from Art on the Greene! I was hoping to post to the blog live throughout this weekend, but the only Wi-Fi available in the area is connected to Cowboys Stadium, and it requires a subscription. Imagine that. So, I’m at my dining room table, sore over every inch of my body from yesterday’s six-hour load in and set up. But Friday evening drew over 3,000 to the park, and sales were quite good, and the conversations were even better. The patrons are a lovely crowd so far this year. The weather is supposed to be optimum for an art festival, and I can hardly wait to get back today (assuming the Advil is going to work). Today (Saturday) we are open from 11 till 11:00. Tomorrow from 11 till 5. The music is spectacular. I’m eagerly anticipating today’s performance of Voodoo Blue (Stevie Ray Vaughn tribute band), taking the stage around noon. If you get a chance to come by, I am in booth #53, at the “T” intersection on the west boundary of Richard Greene Linear Park. We are at 1601 E. Randol Mill Road, between Cowboys Stadium and Rangers Ballpark. If you walk behind my tent, you will literally tumble into the canal far below. 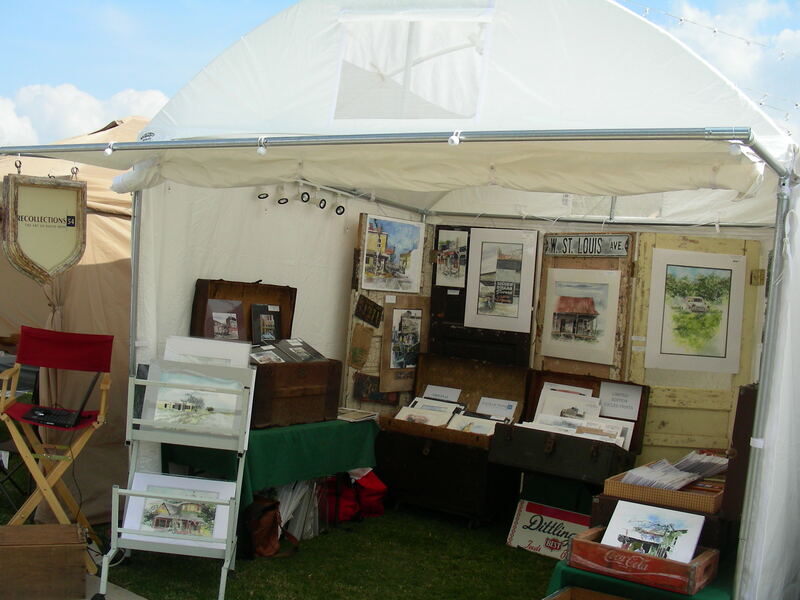 I do indeed have a scenic spot, and am thinking about trying some plein watercolor from outside my booth today. Thank you for reading. I hope to see you at the festival. This space has certainly evolved. For about the last four years, I have been in a perpetual migration, searching for studio space to experiment in watercolors. I have enjoyed the extra bedroom in my house that formerly served as a study for my high school and college preparations. I have also been grateful to the Burson Gallery in Hillsboro for providing studio space during summer months over the years. I have as well enjoyed the back of my open Jeep Grand Cherokee, the idyllic pasture lands of Lyndon Acres in Burleson, and anyplace else I could park to work in watercolor, whether en plein air or in an enclosed room. 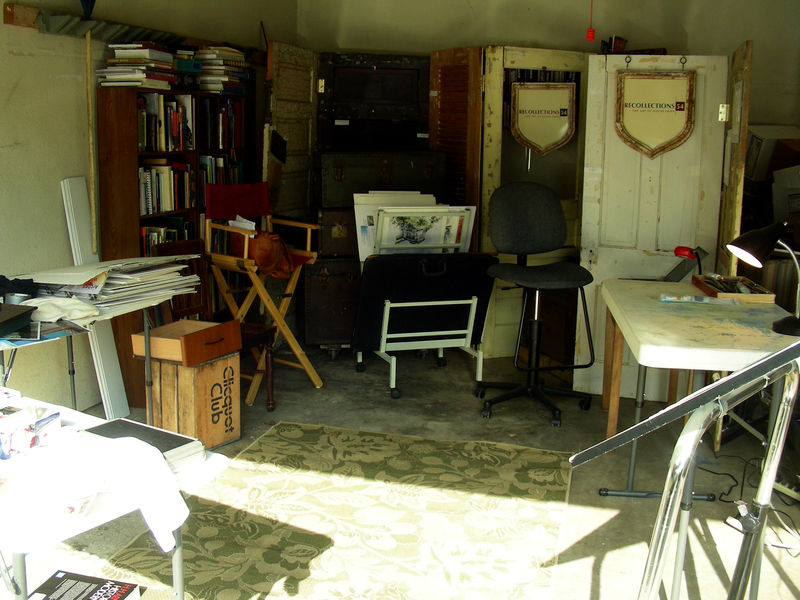 Over the past year, I have been carving out space in my garage, laughingly calling it the Man Cave. But recently, I have taken this space more seriously, especially enjoying its sweet solitude late at night, with the door open, and the cool evening Texas breezes filling it. During Spring Break, I spent most nights (and mornings after midnight) in this space. Having recently moved my art festival booth furnishings to the perimeter of this space, I hatched this wild idea last week of converting this into a studio space to accommodate more than one person. That idea filled some of the space of my Spring Break. I especially enjoy now the presence of a portable TV/VCR where I have been rolling interview tapes of Willem de Kooning. I’m also benefiting from my vintage stereo and turntable (LOVE listening to Muddy Waters LPs!). I also have several easels upon which I can put up my works in progress and view them from across the garage while I’m working on something else. I have two bookcases filled with my art, literature and philosophy monographs, as well as a number of comfortable chairs and reading lamps, along with five tables with ample space for organizing paintings, art supplies, journal, laptop and whatever else I need. I feel that I could compete with Robert Motherwell as to library/studio/office space, though I could no doubt have used a portion of his financial fortune for a “prettier, classier'” space. The timing of this couldn’t be better. 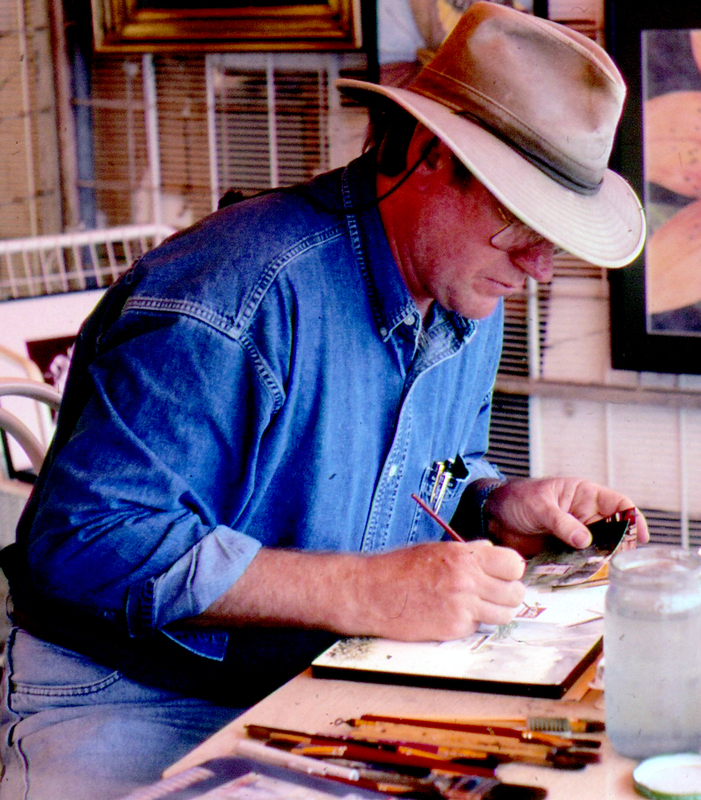 An artist from Wichita, Kansas is due early this evening to take several hours of private watercolor lessons from me. He has come to visit his daughter who lives in a nearby town. We met at the Grapefest art festival last fall in Grapevine, he took my business card and inquired about private lessons. So, now he is choosing to give me a chance. I don’t know exactly how to put this–I don’t feel like a “master.” I don’t. I’m still a curious student of watecolor, still learning, still experimenting, still reading, still devouring museum art and trying to find myself in this wonderful medium. But having been a teacher of academics since 1985, I will honestly say that I love teaching, I love giving, pouring out my heart and passion, in any way that will benefit someone wanting to learn new things. And I am profoundly grateful to this man for giving me yet another chance this evening to share these things. I cannot wait for him to arrive (and I hope my space suits him, as he will be the first “customer” to enter and use this space!). Thanks for reading. I still have some tidying to do, as you can see from this photo. We don’t know how it happened. 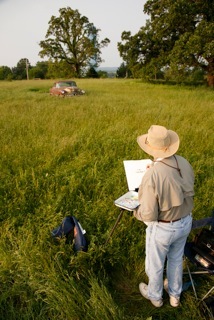 Last year, I painted an aged Desoto in a pasture in Cotter, Arkansas, during a Plein Air competition that I was judging. Outdoor Painter magazine (an online home for Plein Air magazine) published my painting in its announcement of this year’s competition. None of those in charge of the event know how the picture got lifted–it is not included in their Facebook albums. At any rate, I’m very pleased and proud to be published again. I just don’t know who to thank.